OTTAWA & MONTREAL, Canada – October 11, 2018 – Bluwave-ai and TUGLIQ Energy Corporation have signed a multi-year strategic partnership bringing innovations from both of these Canadian companies to enhance renewable energy deployments and efficiency in grid-attached and remote microgrids. As part of the partnership, TUGLIQ will have the opportunity to enhance energy efficiency in their deployments with AI-assisted prediction, optimization and control of generation and load assets. TUGLIQ is a world leader in the deployment of complex energy intensive projects in rugged environments and islanded microgrids in the developing world. BluWave-ai’s distributed AI-based software optimizes the operation of smart grids and microgrids. It uses both real-time and archived data to perform accurate predictions of loads and renewable generation output, sending recommendations, signals and actions to optimally manage grid resources, which have the potential for large energy savings at TUGLIQ’s microgrid deployments. “TUGLIQ has had a major impact with its renewable energy deployments in the Canadian North for both communities and commercial customers who have no connection to the main North American grid,” said Laurent Abbatiello, CEO of TUGLIQ, “We are enhancing the renewable energy penetration at multiple locations such as the Raglan Mine and look forward to adding further automation with BluWave-ai’s artificial intelligence to dramatically decrease communities’ diesel consumption.”One of the main objectives of the partnership is to leverage innovations hardened in Canadian deployments to leverage in large growth markets in the developing word to enhance Canada’s export strategy. One of the main objectives of the partnership is to leverage innovations hardened in Canadian deployments to leverage in large growth markets in the developing word to enhance Canada’s export strategy. 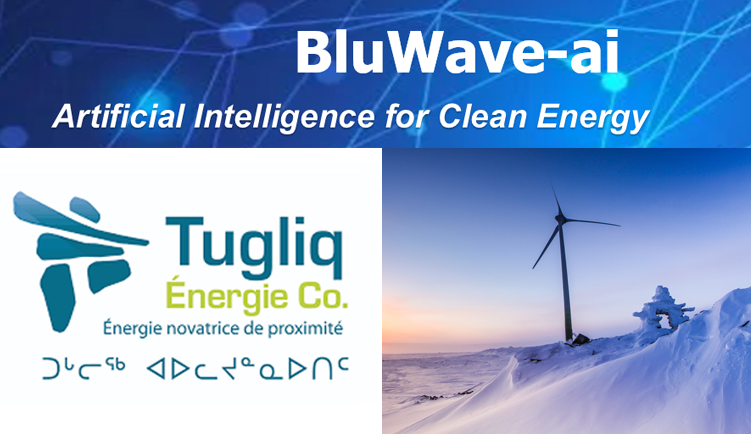 “BluWave-ai is working with utilities and independent power producers such as TUGLIQ in the Canadian Market for a global competitive advantage with innovative adopter customers,” said Devashish Paul, CEO of BluWave-ai, “With TUGLIQ’s success in both Canadian and global markets we sought them out as an ideal partner given their strategy for electrification with wind, solar, battery, and diesel reduction and BluWave-ai's technology to predict, optimize and control smart grid assets in this context. "BluWave-ai’s solution consists of components at the edge and cloud data center which can be licensed with a SaaS model. BluWave-ai Edge is installed at the aggregation points of IoT sensors, meters, and other sources of data. The physical location can be at edge computing nodes, a private data center or public cloud. BluWave-ai Center machine learning runs in either the private data center or public cloud, collecting data from Edge nodes to train AI models and coordinate functions between multiple BluWave-ai Edge locations. It includes an ensemble of machine learning and statistical techniques that discover patterns in data, performing predictive analysis and pattern recognition in real-time, based on a portfolio of patents filed with the USPTO this year. AI models include wind, solar, battery state-of-charge, load, and energy market pricing. ‍‍‍BluWave-ai Edge and Center products will be deployed in TUGLIQ pilot projects over the duration of this agreement. TUGLIQ, “the next one” in Inuktituk, conveys “proximity energy” and “energy of the future”. TUGLIQ offers cost-effective, leading-edge alternatives to diesel and heavy fuel oil, focusing on islanded microgrids in remote regions, where climate change exerts a heavier toll on communities and on the environment. Oil is a wonderful liquid, that must be conserved for future generations as a raw material for plastics, tires, and other manufactured goods essential to modern daily life. It should not be burnt in the air, nor leaked to water, nor ingested in lungs. Air and water quality affects every one, be they rich or poor, first nations or new immigrants, within or beyond frontiers. TUGLIQ’s mission of replacing oil with more sustainable alternatives is worthy of our best talent and best years, so that we can pass onto the next generation(s) a better world than we were born into.